Okay. I typically collect modern dollhouses in 1:12 scale—and a few in 1:16/1:18 scale. 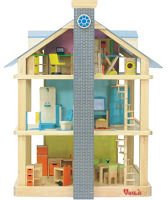 However, I am seriously considering a purchase of the Voila Toys Giant Dollhouse, which is 1:6 scale. I mean, I really have a crush on this massive toy—since 2006. There’s really nothing architecturally astounding about it—other than its size. It just looks fun! It stands slightly less than 5 feet, has 3 stories, 12 rooms, 2 spiral staircases and 3 fireplaces. The dollhouse even has casters to easily move all around. It comes with a set of dolls and is fully furnished. 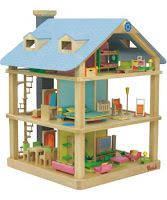 The design is reminiscent of the Voila Toys Large Dollhouse which is 1:12. The construction is rubberwood so it can take several beatings and still look fab over the years. I see it as this cool item in one of my children’s rooms and later the cool toy at my house for my grandkids. It’s roughly $1,300 retail—and probably double once you ship it to the States. Hmm. plus 17.5% VAT (on both house and shipping!). I almost fell off my chair before I realized the mistake. . .
Sea shipping it is! Ha Ha! Whoa and Lordy! I know it's gonna be a $2K+ range purchase. I'm trying to acquire it through some American merchants who can order it. It used to be available at FAO too, but I missed the chance. Have to have it. Its awesome and unique size plus quality construction make it a must-have in the collection of toys at my home. Well, I guess I didn't miss out. FAO Schwarz expects to have this dollhouse available again this year--closer to Christmas time. It's a seasonal item. It will retail at $1,600 with an additional $45 handling charge. The shipping is basic ground. Hmm--I hope they really do carry it. We'll see! did the doll house you were looking for come back in stock? No, it didn't! I was going to post about it but thought it to be more boring than the usual posts on here. FAO had a giant dollhouse but it was a LAME job--not the Voila Toys version. Altera told me about the online store when I was looking up the Voila Large dollhouse. Not sure how much it's to ship to U.S. but I am guessing that it can't be as bad as coming from UK. 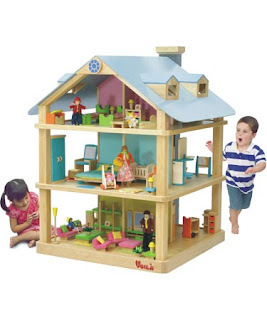 Hello - Has anyone had any luck on locating the Voila Giant Dollhouse in the U.S. or Canada for Xmas 2009? It's still available online at a few toy stores in Australia, but I cannot locate it domestically.